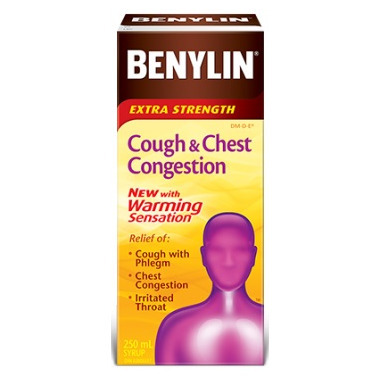 Benylin Extra Strength Cough & Chest Congestion with Warming Sensation Syrup is specially formulated to work in your chest to help clear out heavy congestion while calming your cough and relieving cold symptoms. Its warming properties instantly soothe and coat your throat. Alcohol, citric acid, FD & C Blue No. 1, FD & C Red No. 40, flavour, glycerin, menthol, monoammonium glycyrrhizinate, polyethylene glycol, polyoxyl hydrogenated castor oil, propylene glycol, saccharin sodium, sodium benzoate, sodium chloride, sodium citrate, water, xanthan gum. 2 tsp. (10mL) every 6 hours. Maximum 8 tsp. (40mL)/day. Warning: Talk to a doctor before using this product if you have high blood pressure, heart or thyroid disease, diabetes, asthma, chronic lung disease/shortness of breath, persistent/chronic cough, glaucoma or difficulty urinating due to enlargement of prostate gland, or are elderly, pregnant, breastfeeding, or taking a drug for depression, including monoamine oxidase (MAO) inhibitor drugs. Check with a doctor if cough worsens, lasts more than 7 days, or tends to recur, if sore throat pain persists for more than 2 days, or if you also have excessive secretions or fever. Do not take more than the recommended dosage.